I'm a little bit obsessed with a restaurant here in the city called Fatty Crab. A funky take on Malaysian street food, the menu is an absolute assault of spice and flavor (in the best possible way). I went there for the first time last August for my friend Lindsay's birthday, during which she, a few friends, and I spent two hours splitting spicy family style dishes and moaning over every new flavor. I seriously loved my first meal there so much, that I spent the next month daydreaming about it and trying to recreate the dishes at home. After hearing about me rave and rave for months, Eugene finally agreed to join me for a meal there. I was so psyched about this, and bopped around the apartment in expectation for days, convinced that he, too, was going to love it. For some, weird strange reason that I still don't understand, he doesn't like the place. You can imagine how much of let down this was; I would eat at this place constantly if I could, but my main and most adored dining companion is... Just. Not. A fan. I've come close a few times; once with a recipe for gingery meatballs that have been sitting in the queue for ages (soon! I promise!). 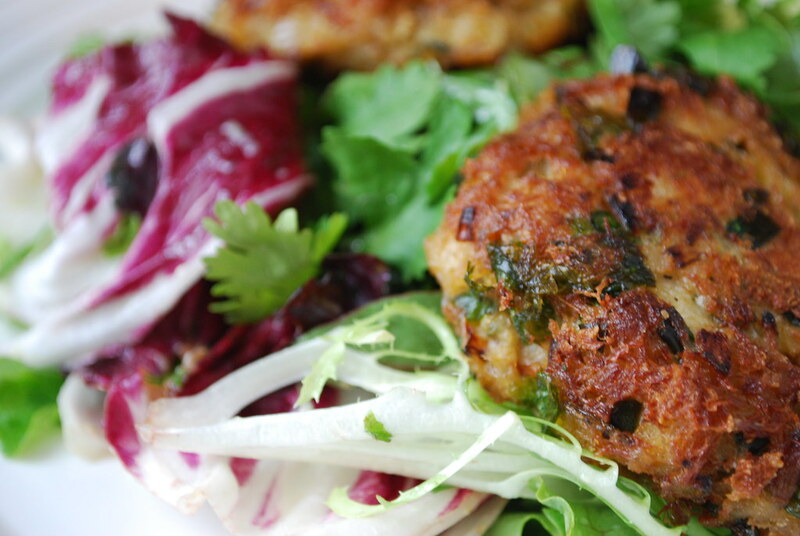 My latest creation are these ginger and scallion crab cakes, which are packed with ginger and cilantro and enough heat to quell my Fatty Crab fantasies, at least for a week or so. 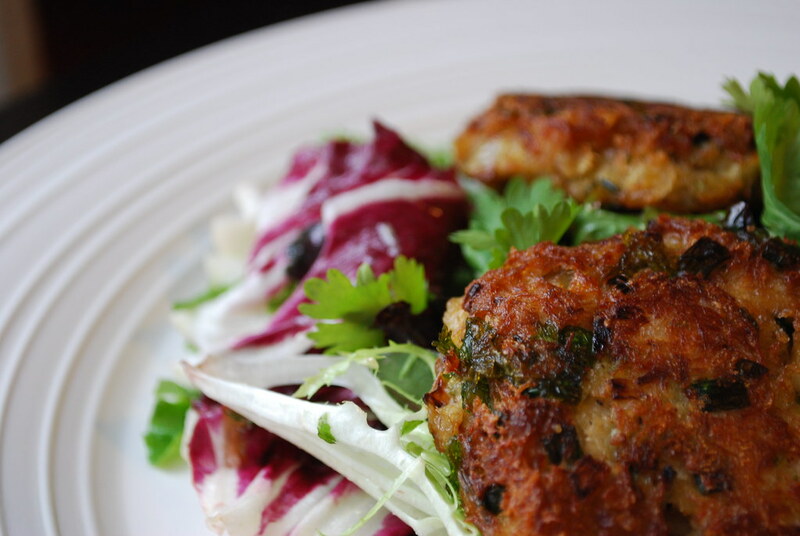 Even if you have no idea what I'm talking about when it comes to this place, trust me when I say that these crabcakes are absolutely delicious and make for a brilliant dinner or lunch. They can even be prepared ahead of time, so that all you have to do before dinner (or a dinner party) is heat the oil and sizzle them until golden. If you're wondering how to serve them, I love them over a big bed of mixed greens dressed with a mustardy vinaigrette (just whisk together a tablespoon of mustard with some red wine vinegar, diced shallots, and olive oil and toss with the greens). Depending on how big I make them, 2 or 3 crab cakes per person is enough for a meal. If you want something a bit heartier, you can also serve these with a lemon risotto, or with any number of grilled or steamed vegetables. 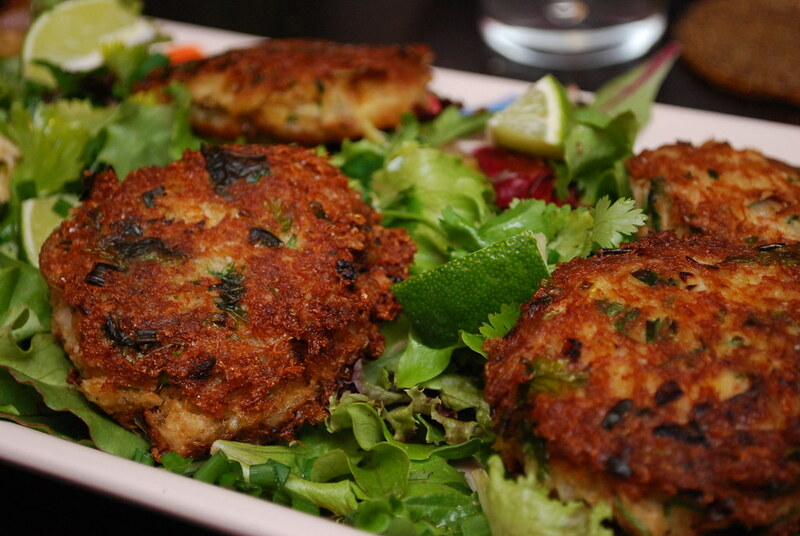 I dig them with the salad though; crab cakes and salad are just perfect in my book. I hope you enjoy these! And if my raving has motivated you to check out Fatty Crab for yourself, email me first at Alejandra@AlwaysOrderDessert.com and I'll send you a list of my favorite "must try this" items from their menu. A BONUS Challenge For You: I'm going to officially put it out there that I will bake a big 10" cake of your choice to the first person who obtains and sends me the recipe for those freaking amazing chewy mochi cakes (the actual Fatty Crab recipe, that is). Heat a couple tablespoons of olive oil in a medium sized skillet over medium heat, and add the minced garlic, shallots, and ginger. Saute for 2 minutes, just until they start to get a bit of color and release an aromatic smell. remove from heat and pour (along with oil) into a large bowl. To the bowl, add the chopped scallions, cilantro, minced jalapeno, red pepper, mayonnaise, lime juice, soy sauce if using, egg, salt, and black pepper. Mix until well combined. Fold in the panko and crabmeat and gently mix until well combined (careful not to break up the crab meat too much). Use a large spoon to scoop up servings of about a 1/2 cup and shape into a patty with your hands. Place on a wax or parchment paper-lined baking sheet and repeat with the rest of the mix (depending on how big you make the patties you should get about 8-10 patties). Let the patties set for about 10 minutes (I used the time to clean up). Pour about a 1/4 of olive oil into a heavy bottomed skillet (meaning the oil should come up the pan about a 1/4 inch) and heat over medium heat. When the oil is hot, use a spatula to gently slide the patties into the oil in batches. (I do 2-3 at time, max). Let fry on the first side for about 2-3 minutes and then flip using the spatula. Let fry on the other side for another 2-3 minutes or until crisp and golden brown. Remove from oil and let drain on a paper towel lined baking sheet. Continue with the rest of the patties (you can also just make a few of them and leave the rest covered with plastic wrap in the fridge for up to 2 days). Serve immediately on a bed of dressed mixed greens or with another favorite side dish. Offer cocktail sauce on the side, if desired.